Got my corsa vxr mapped stage 1 there yesterday, happy with the results. Lads there also explained what I need for stage 2 etc. Good service definitely recommend. Deskjock is one of the UK's favourite consumer review sites packed full of exciting features and special offers giving you a real insight into transparent customer services and improved client relationships. 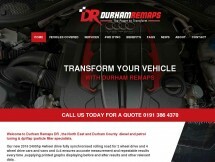 Our customer feedback and product integration to let you make an informed decision about Durham Remaps.